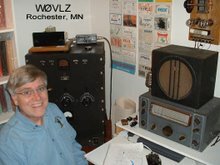 Today I was at the Rochester, MN UPS depot at 10AM sharp to pick up my new radio. I got serial number 43 of, I expect, thousands. Elecraft has crammed a lot into a small box. I spent most of the day figuring out how to use it. One QSO so far. KB5AE in Ada, OK answered my CQ on 20 CW. He reported a fine 579 signal down his way.